In Malaysia, they eat curry with rice same as Japanese curry style, but also Roti Canai ( looks like pan cake? ) 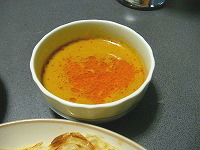 is very popular to eat with curry. It's really kinder to India "Nan". "Roti" means "Bread" and "Canai" means "Throw and flying thing". 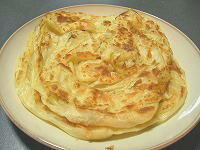 Roti Canai is create by mixing water and wheat. Knead it by throwing and strike it again and again. At last they make it very thin and fold it and bake on the pan. They often eat it in break fast and lunch time, and also can eat it in tea time if it's sweeter one. There are also many kind of curry types eating with Roti Canai. Left hand picture is Dal Curry, which is including beans in it and right hand picture shows Cari Ayam. It means Chicken Curry. 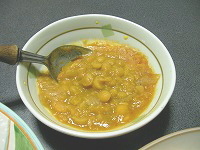 Dal Curry is India food, and they use India beans(dal) for it. In Japan they call curry means using only beef in it, but of course its only Japanese culture, so real India curry has beans curry, fish curry and chicken curry, many kinds of style. Vegetarian is also popular in India too, so this Dal curry is proffered by many peoples. When I visited in Malaysia, I also ate Roti Canai & Curry every morning on my way to go to the bus stop. In my opinion, I like Dal best. I addicted by this amazing taste and tender soup and smelling. Basically Malaysian eats bye their hand, so I also becomes good at eating by my hand. I was often joined Malaysian friends food party too, so that was helped my growth too. If you habit with eating by hand, maybe you'll feel it's really convenient. In India restaurant in Japan, also can eat using by hand and they have Dal Curry on the menu too. So why don't you try it once?